Are your girlfriends needing some peace on earth and wholesome humor? 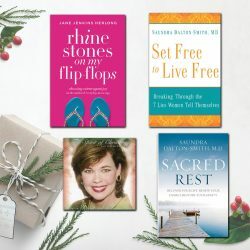 Give the gift of laughter and rest! Dr. Saundra Dalton author /speaker and I have a GREAT deal filled with “stress-less” tips and lots of humor. All for the low price of $50 which includes gift-wrap, personalized Christmas card, and shipping! This is a $40 savings!